One week has passed since the New York Giants traded Odell Beckham Jr. to the Cleveland Browns, and the dust hasn’t settled. The NFL world is still buzzing over the deal, which came 13 days after Giants general manager Dave Gettleman adamantly said he wouldn’t trade Beckham. The 49ers were among the teams in the Beckham sweepstakes throughout the past year. When news broke that the Browns traded safety Jabrill Peppers, as well as the No. 17 and No. 95 picks in April’s draft, to the Giants, many wondered why the asset-rich 49ers didn’t walk away with the All-Pro receiver. On Monday morning, new details emerged, from Gettleman himself. He addressed the media for the first time since the trade happened. Gettleman told reporters the 49ers were “consistently interested,” though the Buffalo Bills are the only team Gettleman reached out to after they lost out on Antonio Brown. Peter King divulged more details in his Monday column. 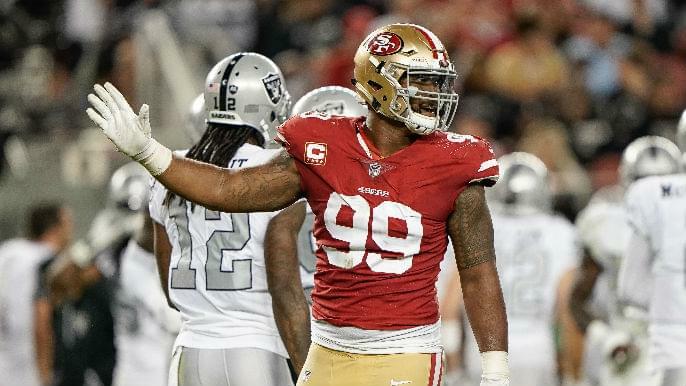 King wrote that the Giants were interested in acquiring DeForest Buckner, who compiled a career-high 12 sacks and was named to his first Pro Bowl in 2018. Below is the excerpt from King’s story. Gettleman had to decide whether he wanted to leverage the Cleveland offer with other teams. Because Beckham’s stock had been tarnished, it’s doubtful, for example, that he could have fetched better than 17-95-Peppers from the 49ers for picks and/or a player in the next two drafts. The Niners have been sniffing around Beckham for months. But they’re just not a good match right now. The Giants need high picks and/or productive players. The Niners wouldn’t have wanted to trade a high pick this year or next plus rising star defensive tackle DeForest Buckner … and the Giants might not have wanted to settle, say, for next year’s first-rounder and this year’s second-rounder (36th overall) plus a lesser player than Buckner (say safety Jaquiski Tartt). The Giants need help now. So Gettleman took the bird in the hand. He lanced the boil. The 49ers evidently did not want to trade Buckner, the backbone of their defense, as he enters the prime of his career. The team wants to sign him to a long-term deal. And the 49ers apparently did not want to surrender this year’s No. 2 overall pick, even if that meant getting Beckham and potentially New York’s No. 6 overall pick.